Are you a MIIS faculty member, staff person, or student and planning to undertake a human-subjects research project? Do you want to know what “human-subjects research” is, whether you need to go through an IRB review, and what the review procedures and requirements are? If your answer is “yes” to any of these questions, you are urged to attend this event. Katie Gillespie, Middlebury Research Compliance Manager, will introduce the IRB procedures and requirements and will field questions. MIIS representatives on the IRB, Tsuneo Akaha and Julie Johnson, will also be there to facilitate this event. For inquiries about this event, please email Akaha at takaha@miis.edu or Johnson at jejohnso@miis.edu. This entry was posted in Midd Blogosphere and tagged Midd/MIIS Collaboration, MIIS News & Events on April 16, 2018 by Katie Gillespie. We’re excited to announce the Sustainability Pledge Benefit available to all Middlebury College faculty and staff! One of our core values at Middlebury is a commitment to leadership in environmental stewardship and sustainability. As a way to support this value and to celebrate our recent achievement of carbon neutrality, Middlebury is encouraging employees to reduce their personal carbon footprint by offering a Sustainability Pledge Benefit, thanks to a generous gift from a local donor. Middlebury will offer employees up to $200 towards qualifying sustainability purchases or actions. Employees whose household incomes are eligible for 3SquaresVT benefit can receive up to $250 towards qualifying sustainability purchases or actions. Qualifying purchases include things like Community Supported Agriculture (CSA) shares, membership of a local food cooperative, seeds, composting equipment, bicycles for commuting, and ENERGY STAR appliances – see the program website for full details. Note that we have a limited fund, which is being offered on a first come, first serve basis until the funds are used up. 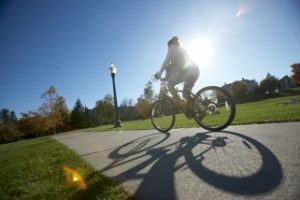 Visit the Middlebury Sustainability Pledge Benefit web page at: http://www.middlebury.edu/sustainability/academics-and-research/environmental-council/sustainability-pledge-benefit and review the tips on how to reduce household and transportation carbon emissions. Choose one or more of the actions and purchases that are eligible for the benefit and sign the pledge to reduce carbon emissions and the specific actions you will take. Carry out your qualifying action and/or make your purchase and complete the reimbursement form with proof of purchase no later than June 5th. After submitting the form and proof of purchase/action you will receive your reimbursement via your payroll check (note: reimbursements are subject to income tax). We look forward to supporting your efforts as you reduce your carbon footprint! This entry was posted in Midd Blogosphere and tagged For Faculty, For Staff, Midd Points, Midd/MIIS Collaboration on May 2, 2017 by Katie Gillespie.